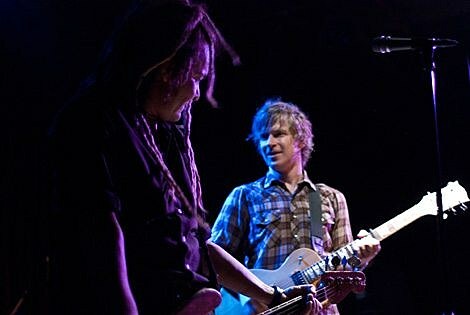 Nada Surf will headline the Paradigm CMJ Showcase at Mercury Lounge in NYC on October 22nd. This is a really small venue for the band, and limited tickets are on sale now. Badge-holders will get a chance to get in too. Other bands on the bill are Dale Earnhardt Jr. Jr., Francis & the Lights, Reptar, JBM, Blair, and Ume. At the moment the Mercury Lounge show is Ume’s only CMJ show, but they have a day off on their nearly month-long fall tour. All dates are listed below. JBM recently completed a tour with AA Bondy. AA Bondy plays a NYC show TONIGHT (10/6) with Diamond Doves and Dawn Landes who both played with JBM when he played Mercury Lounge in July. JBM, who played a BV CMJ party in 2009, currently has no other upcoming shows listed outside of the Paradigm Showcase.